Bull City Fencing is a family owned and operated business that has been proud to serve the Triangle and surrounding areas for over 25 years. We are a fence company located in Durham, NC. We are proud members of the American Fencing Association. At Bull City Fencing, we specialize in all types of fence including aluminum fence, wood fences and more. Commercial & residential services available. We are fully insured and offer free estimates! Bull City Fencing provides professional fence installation service to residential and commercial customers in Durham, NC and throughout the entire Triangle area. 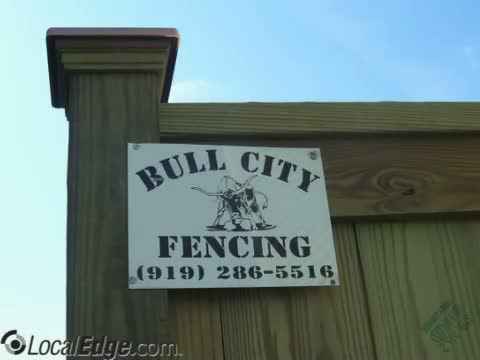 With over 25 years of experience, Bull City Fencing is one of the best established companies in the area with a current membership in the American Fence Association (AFA). Our fence company is available Monday through Friday from 8:00AM to 5:00PM and are ready to help you with all of your fencing needs! Providing your property with all types of fencing at an affordable price! Our dedicated team is focused on making sure that our customers are satisfied with our work. Every fence installation project is important to us and we work hard to ensure that we exceed your expectations. We want to spend the time and talk to our customers and make sure that they are satisfied with our work. With our dedication to our work and our affordable prices, we aim to be the number one choice for professional fence installation service in Durham, NC. Professional fence installation service includes: vinyl fences, wood fences, Aluminum fences, chainlink fences, wood privacy fences, iron fences, split rail, ornamental, custom picket fences, gate access control, commercial roll gates, galvanized and vinyl coated fences, fence posts and fittings.